Thomas Nelson Page. Italy and the World War. 1920. Chapters 13-15. On the same day the Italian Government notified its Ambassador at Berlin of the step taken, and instructed him to inform the German Government thereof, and to explain to it the close connection between Italy's foreign and domestic policy, and make it plain that the current of public opinion manifested by those in favor of neutrality did not signify any renunciation of Italian interests in the Balkans and the Adriatic, or of Italy's aspirations, but simply that they considered that these would be rather promoted by her neutrality. And that, should the contrary appear, the reaction in Italian public opinion and the consequences thereof would become very grave, and this the Government was obliged to take into cognizance, and prevent if possible. This step, it was understood in Italy, was to place Italy in an entirely independent attitude in her dealings with Austria, and obviate any contemplated action on Germany's part as an intermediary. To this notification, the Austro-Hungarian Government responded in a long argument, declaring that its occupation of any part of Serbia was simply momentary and in pursuance of military exigency, and it declined any exchange of views as to the matter as unnecessary. Germany, however, acted promptly and, as might have been foreseen, effectively to prevent Italy's having any opportunity to break with Austria, and on December 15 the Italian Government received information from its Ambassador in Vienna that Germany had "succeeded in convincing" Count Berchtold of the importance of entering into an exchange of views with Italy touching the "compensations" provided for in Article VII of the Triple Alliance Treaty should Austria-Hungary occupy any part of the Balkans either permanently or as a merely military occupation. This was followed by considerable correspondence between the Governments of Italy and Austria-Hungary, with an occasional exchange of ideas and consequent steps on the part of Italy and Germany, in which Italy's interests and aspirations beyond the Adriatic were presented veiled in more or less nebulous diplomatic language. Through it all, however, Baron Sonnino, speaking for Italy, held firmly to the idea of Italian revindication of what Italy deemed Italian. Austria-Hungary, pressed by the Serbian forces, withdrew from the regions occupied by her in Serbia; but Sonnino insisted that this did not settle the question he had raised. He did not, he stated, wish to be placed in the position of appearing to seek a quarrel with Austria, but the ground of future friction and enmity, and more, still remained and should be eliminated. In the discussion which went on, each side endeavored to induce the other to formulate what would be demanded or conceded; but both were too wily to be caught in such a manoeuvre, which would have placed in the other's hands a potent weapon. As the discussion proceeded, however, Italy's aspirations were gradually disclosed in plainer and more enlarged terms. Baron Sonnino informed Prince von Bülow on the 1st of February that he would not define Italy's demands so long as Austria stood out against the principle of cession of territory held in the Empire, whether they concerned the Trentino, Trieste, Istria, or anything else, and he gave an intimation that the difficulties and exigencies were not diminishing. (76) This was a plain intimation of Italy's claims now extending beyond the irredentist formula of, "The Trentino and Trieste." Austria-Hungary now began to argue that Italy herself had gone beyond the provisions of Article VII in holding on to the Dodecanese and in occupying Valona. But that argument of Tu Quoque had little effect on the Italian statesmen, and the chief result was that the discussion turned off to old issues which rather increased than diminished the antagonism between the two Governments. About the middle of February there was a certain stiffening of public opinion in Italy. After considerable more or less apparently futile discussion as to Article VII, Baron Sonnino, on February 17, instructed the Italian Ambassador at Vienna to inform the Austrian Government clearly that its failure to interpret this Article otherwise than as requiring the antecedent accord with Italy as to compensation could not be regarded by Italy as other than a violation of such Article and evidence of Austria's determination to resume her freedom of action and, in such case, Italy would hold herself fully justified in resuming her own freedom of action with a view to safeguarding her interests. Fate was now moving with sure steps. After further discussions, in which Austria declined to concede Italy's interpretation of Article VII, to the effect that the movement on Austria's part against Serbia required an antecedent accord with Italy, the Italian Minister sent, on March 4, a final reassertion of Italy's position to the following effect: First, that no military action by Austria in the Balkans could be taken without a complete antecedent accord with Italy, who stood rigorously by the text of Article VII. Second, that every infraction of the foregoing would be considered by Italy as an open violation of the Treaty, which would cause Italy to resume her full freedom of action to guaranty her own rights and interests. Third, that no proposal or discussion of compensation availed to lead to an accord which did not contemplate cession of territory already possessed by Austria. Fourth, that, based on Article VII, Italy exacted compensation for the initiation of the military movement in the Balkans by Austria-Hungary, independently of the results which such movement might attain, without waiving her right to demand further compensatory concessions conditioned on further advantages which Austria-Hungary might obtain. Fifth, that with regard to the compensation for the initiation of the military movement, so far from its being kept secret, as Austria had desired, it must be effectively carried out by the immediate transferrence of the territory ceded to Italy, who would occupy it at once. Sixth, that, for reasons already given, Italy would not admit any claim by Austria-Hungary for compensation for Italy's occupation of the Dodecanese or of Valona. This bold notification appears to have awakened both Germany and Austria-Hungary to the gravity of the situation, and the Austrian Minister for Foreign Affairs, Baron Burian, on March 7, voluntarily informed the Italian Ambassador that he would very shortly give an answer to the Italian view of the principle of Article VII. Prince von Bülow, on his part, notified Baron Sonnino that his Government considered that it could assure Italy of Austria-Hungary's final change of attitude on the principle of Article VII. This was followed a day or two later by a communication from Berlin that the Austrian Government had requested Germany to notify Italy that it was ready to enter into negotiations with Italy conformable to Baron Sonnino's proposal, and on the basis of the cession to Italy of territory possessed by Austria. The proposal was also made that the Government's declaration to the Italian Parliament should be prepared in concert with Austria. On this, Baron Sonnino observed that he had never proposed to inform the Parliament of the opening of negotiations regarding the matter, but had referred to the necessity not to keep secret the accord as soon as it should be concluded. The condition as to cession of territory held by her was not, in Austria's view, possible, and Prince von Bülow used all his diplomacy to obtain from the Italian Minister a modification of it. But Sonnino stood firm. Perhaps, he knew what the result would be, as he certainly knew what the effect on the Italian people would be should Austria reject his conditions. On this, Austria haggled for a time; but eventually, on April 1, she offered The Trentino, but demanded therefor a free hand in the Balkans, including complete control in Albania, and Italy's repayment of all the government's outlay in the region ceded and her assumption of the proportionate part of the public debt. She also demanded guaranties of Italy's benevolent neutrality. This, Sonnino likewise rejected, referring to Austria's offer as "a strip of territory," and Burian renewed his request that he formulate his demands. When later on in April (8), after further negotiations in which Austria-Hungary appeared at first to spar for time, the Italian Minister finally consented to formulate Italy's demands, they were so far-reaching and comprehensive that the Austro-Hungarian Government declined firmly to accede to those on which Italy counted most, and Italy cast in her lot with the Allies, and made her decision of renouncing formally her treaty of defensive alliance on which she had founded her whole foreign policy for thirty odd years. The step contained in it the dread decision of war. During these negotiations, along in February (1915), the conditions in Italy appeared to have reached a somewhat new phase; public opinion appeared to indicate that the military situation had improved greatly within the last two months and that matters were approaching a crisis. A marked rise in the price of all foodstuffs had at one time caused serious anxiety, and a certain commotion had ensued, more especially in the southern part of Italy and in the region bordering on the Adriatic. The Government, however, was manifestly using its best efforts to ameliorate the situation. It had done away with imposts on grain and had taken possession of vessels available to transport grain to Sicily and Sardinia and to Adriatic ports from which fear of floating mines and of other war perils had driven the customary privately-owned vessels on which that shore largely depended. The store of grain reached, by report, as high as 8,000,000 bushels. It was evident that something of moment impended. All sorts of rumors circulated in regard to negotiations between Italy and Austria and Italy and Germany. In face of what impended, Italy, as generally happened in face of a great crisis, grew calm. It was well understood that if Italy were to maintain her position and, possibly, even her form of Government, she must find her condition improved at the close of the war. The division in public sentiment was whether this should be done by diplomacy or by arms. The improvement in her situation depended on two conditions: the realignment of the boundaries between her and Austria so that The Trentino should be taken within those boundaries and become once more geographically an integral part of Italy; and the extension of those boundaries along the Alpine summits and the rivers so as to leave her with a defensible confine. Secondly, the extension of her authority so as to create for her defensible frontiers to the eastward. This meant that she felt that, so long as Austria commanded all of the strategic positions and the extended inner waterways and harbors on the eastern side of the Adriatic, so long, Italy would remain under the menace of her guns. Some informal steps were taken about this time by representatives of neutral powers to sound the representatives of other neutral powers as to the possibility of acting in a certain concert and addressing identic notes to the belligerents; but it was learned that Italy did not feel inclined to take part in any collective action, but felt rather that even should any move be made along parallel lines at any time, it would be better for her to move individually. The great movement made by the Allies with a view to forcing the Dardanelles and capturing Constantinople had a certain effect on the public opinion of the people in Italy; but the statesmen who were better informed inclined to feel that the enterprise as actually conducted in the first instance by the sea power alone could hardly succeed unless the forces were greatly augmented. Should the requisite forces be sent, it was considered that it would tend at least to "ripen matters," especially in the direction of the Balkans. During the progress of these negotiations, which were naturally not wholly unknown to the Allies, the latter were striving unremittingly to prevent any settlement of the questions involved which would keep Italy from siding actively with them. They accordingly followed with acute interest the efforts of the German and Austrian Ambassadors, Prince von Bülow and Baron Macchio, to bring about a satisfactory solution of the questions between Austria-Hungary and Italy, and endeavored sedulously to prevent the two governments from coming to an agreement. The wide and irreconcilable divergence of fundamental interests of the two nations presented to the Allies a fertile field for the exercise of their active diplomacy. They recognized the passion of Italy as they recognized the supreme importance in Italy's view of Italy's emancipating herself from the perpetual menace of Austrian invasion by securing frontiers that would be reasonably defensible along the whole Austrian line. To these two motives they addressed their diplomacy, with fruitful results. As the possibilities of a successful issue of the German-Austrian and Italian negotiations fluctuated, the Allies grew more anxious and more pressing, and active negotiations began between their representatives and the Italian Government to bring Italy into the war on their side. The record of these negotiations has not yet been published, but the secret Treaty, which was signed at London on April 26, 1915, as their practical result, was published by the Revolutionary Government of Russia in 1917, and was translated and republished first in an English periodical,(80) and is now accessible to all in this unofficial form. The conversations which led up to the treaty extended over some little time, as Russia had to be consulted and brought into the plan, as the generally accepted guardian of the Slavs of the South. The result, however, was the Treaty of London. On the same day, April 26, Italy adhered to the London Pact of September 5, 1914, and bound herself to make peace only when her Allies should do so. Nor were England and France entirely complaisant, for it was recognized that Italy's demands were by no means as moderate as they had hoped, and, if acceded to in full, would have a tendency to place it in Italy's power to make of the Adriatic substantially a closed sea and almost an Italian lake. The military situation, however, became so serious, and the belief became so strong that Italy was renewing her negotiations with Austria for the "Parecchio" of Giolitti, that England and France acquiesced in Sonnino's demands, and after certain delays the Treaty of London was signed on April 26, 1915. The secrecy with which its terms and, as far as possible its existence, were guarded, showed Sonnino's careful handling. The rumor became current that France and England had engaged to give more than Austria, and, unhappily for Italy, became prevalent; also the rumor that she was trading at the same time with both sides, and was playing the one against the other to extort the greatest price possible. Even the supposititious terms were stated; but the true facts were not known until the publication by the Bolsheviks of the Russian copy. It is understood that Baron Sonnino's explanation of what has been charged as an example of Italy's wish to drive a hard bargain is that there was no intention of bargaining at all; but the proposal of the terms laid down, so far as they related to the Trentino, Trieste, Dalmatia, and the Adriatic, was based on the necessity to remove from the field of uncertainty and of future contention questions in which Italy was vitally interested, and which if left open might create antagonism and clashes between Italy and the other Allies which might prevent the peace, for which so much sacrifice was being incurred, from being established on a permanent basis. These questions concerned Italy's most vital interests, as they related to the redemption of her irredentist elements, and to her securing frontiers reasonably defensible against her age-long foe and oppressor. As to the rest of the terms, the Ægean Islands were, he contended, taken from Turkey and were held by Italy under the treaty of Lausanne, and Turkey had failed to meet the conditions on which they would have been restored to her. The provisions regarding Italy's share in Asia Minor and Africa were based on Italy's right to be placed on a parity with the other great powers among the Allies, and to have recognized her equal right with them to the development of her economic interests. Fiume was conceded to the Croatians because Russia's consent to the treaty had to be secured and Sazonoff demanded it--ostensibly as an outlet for the Slavs of the South. Such, it is understood, are the reasons assigned by the Italian Minister for Foreign Affairs of the terms demanded of the Allies. That he was somewhat exacting can hardly be gainsaid, but what he demanded was mainly enemy territory, much of which had been wrenched from Italy, and that he had sound reason for his apprehensions and for the position he assumed, touching the frontier in the Alps and the Eastern Adriatic, subsequent events have fully established. The charge which has done Italy so much harm---that she bargained with the two sides to see which of them would give her most for the espousal of their cause ---however it may appear to be sustained to those who know only the surface, is not justified in the view of those who knew the Italian people at that time. These know that they could not have been led to espouse any cause but that of the Allies, at least so long as the Allies held out any recognition of Italy's claim to the redemption of her unredeemed co-nationals. The whole body of the correspondence between the Italian Government and Italy's former allies under the treaty of the Triple Alliance discloses the inflexible resolution of Italy to wrest from Austria-Hungary the irredentist regions, which Italy, at heart, has never ceased to claim as her own, and which, indeed, had never ceased to claim Italy as their mother save in so far as Austria, by transposition and other means, smothered their voice. This and the second, but equally stringent demand of Italy, that Austria should not, without previous arrangement with her, extend her power in the near Balkans, in any manner that would change the status quo in the near East, were steadfastly maintained by Baron Sonnino from the very first step in his correspondence with the Austro-Hungarian Government. The steady enlargement of Italy's idea of what the Treaty of the Triple Alliance referred to as "Compensation," as that idea became defined, the Austria-Hungary representatives termed "Blackmail"; but nothing is disclosed in the Italian correspondence to give reason to believe that Italy would have accepted any "compensation" which Austria offered, or would have offered. Indeed, Baron Sonnino's correspondence is an interesting specimen of the old diplomacy in which the opponent is steadily driven from one position to another without securing anything tangible. Austria was gradually forced to yield, little by little, concessions which she had stoutly maintained she would never yield, and when she had yielded, she was never any nearer attaining her aim than when Italy first laid her complaint before her. A reading of the Italian Foreign Minister's correspondence discloses the fact that he gradually unfolded to Austria's startled vision a programme for Italy which meant the complete surrender of every position relating to Italy's claims which Austria had ever assumed toward her much-imposed-on ally. It will disclose further that he made it plain that it was "not a question of this minister or that, or of this or that ministry," whether the conditions defined were demanded, but that those conditions were demanded by the Italian people, and no ministry could stand which did not meet their aspirations. To the demands of the Italian Government, an immediate answer to which was somewhat peremptorily requested, the Austro-Hungarian Government replied on the 16th of April (1915) that Articles II, III, and IV were unacceptable for reasons given, as were also Articles V, VI, and VII. Article VIII alone was accepted, while Article XI was rejected with a long argument against its inequity. On the rejection of the Italian demands by Austria-Hungary, Baron Sonnino on April 21 notified the Austro-Hungarian Government that its reply did not form an adequate basis for an agreement which should create between the two states that enduring and normal situation which was mutually desired, and announced that the difficulties seemed to be insurmountable. To this the Austro-Hungarian Government, through Baron Burian on the 29th of April, in view of the intimation that Italy might find it necessary to go to war with Germany and Austria to realize her aspirations, replied to the Italian Ambassador with counter-proposals, including one that pointed to Austria's conceding to Italy Valona, provided the rest of Albania were left to Austria. This having been communicated to Baron Sonnino, he, on the 3d of May, sent to Austria Italy's renunciation of the Treaty of the Triple Alliance and her resumption of her complete liberty of action, together with her reasons for such action. Subsequent to this startling declaration the Austro-Hungarian Government submitted new concessions---it was alleged, at Germany's urgent insistence---but these were deemed insufficient, as by no means meeting Italy's minimum demands, and Austria was informed that Italy was taking other means for the protection of her interests. Meantime, both Governments, while wearing the mask of unbroken relations, were straining every effort to be ready for the manifestly approaching struggle which each knew would be to the death. The steps which Italy had taken for the protection of her interests, to which Baron Sonnino referred in his Despatch of May 23 (1915) to the Italian representatives abroad, were those alluded to by anticipation in the Pact of London of April 26---the necessary completion of her preparations for war. On the 23d of May, after a brief, but stormy period covering several weeks, in which riots had occurred in various cities in North Italy, and "demonstrations" were of habitual occurrence in many cities, and in which a Ministerial crisis had taken place, Italy announced her final decision by declaring first that a state of War with Austria-Hungary existed in the zone contiguous to the Austro-Hungarian frontier, and immediately afterward by declaring on the 23d of May (1915) that a state of War would exist between the two countries from the following day. Within an hour or two after receiving the announcement Austria-Hungary also threw off the mask and accepted the challenge. The Emperor issued an address to his People and armies, denouncing his "treacherous enemy," Italy. Map 3. EUROPE AT THE TIME OF ITALY'S ENTRY INTO THE WAR. The decision of Italy was by no means only that of her statesmen charged with her Foreign policy. It was alleged by those who favored her continued adherence to the long moribund and now extinct Triple Alliance that the Italian people were opposed to entering the war, and were dragged into it against their will, under the compulsion of Great Britain and France. But this charge was not as true as if it had been reversed and it had been charged that the People themselves had dragged the Government into the war. Ever since the outbreak of the war there had been an element, both in the Government and among the People, strongly adherent to the maintenance of neutrality, as there had been an element which favored Italy's entrance into the war. But as the time passed and events crowded each other, the former element weakened and the latter grew perceptibly stronger, and for many weeks the war spirit had steadily augmented, especially among the people. That it had not flamed out with greater strength before was due to several causes. One was the long-established conviction that Austria-Hungary was stronger than Italy, coupled with an apprehension of Germany's added power and apparently invincible military organization. Another was the knowledge that Italy was unprepared for war, which had been sedulously diffused by the anti-war party. Yet a third was the broadcast teaching of this party that, however hostile Austria-Hungary might be, Germany was essentially friendly to Italy, and would insure Italy's securing from Austria-Hungary through diplomacy, all of that to which she had so long aspired and as much as she could possibly gain by War. THE rumors of an entente arrived at between Italy and the Allies fell on soil already well prepared to receive them and bore rich fruit in sundry directions. It emancipated the People from the fear that the Government might be overreached by Austria and Germany and be drawn into some arrangement which would bind Italy and debar her from availing herself of any future situation to take her stand with the forces of Liberty, and thus prevent her maintaining a position as one of the great powers, which would have been a deadly blow to her national pride and in a measure to her national consciousness. It relieved the People of the fear that even should she yield to the eager pressure of Germany and receive by diplomatic arrangement the unredeemed provinces of Trent and Trieste, she would subsequently be despoiled of them by the Empires, should they prove victorious. It satisfied them that Italy was now equipped and ready. From the beginning to the end of April matters matured rapidly. Austria, engaged in pushing back the Russians beyond the Carpathians, awoke at last, under the urgency of Germany and of her own representative at Rome, to the imminence of Italy's breaking from her neutrality and flinging her might on the side of the Allies and began to yield a grudging and still piecemeal assent to the demands which a little while before she had flatly rejected, and Germany offered to guaranty the putting into effect of the concessions. But it was too late, and doubtless it would have been too late even had she yielded earlier. For the People had long been steeling themselves for the final, irrevocable step of war. They had made great sacrifices to equip their Patria, and the greatest of all sacrifices: when their sons had gone "for the training "---for war. It had for some time been contemplated to unveil a statue to Garibaldi and "the Thousand" at Quarto, the little port near Genoa from which they had sailed on the 5th of May, fifty-five years before, for the wresting of the Sicilians from a foreign yoke and the uniting them to the kingdom of Italy. Great preparations were made for the celebration of the anniversary of what was one of the most inspiring events in the history of Italy. The Cabinet was to attend the ceremony, and it presently .became known that the King and Queen would also attend. The conviction spread throughout Italy that the occasion would be availed of to announce Italy's decision to take her place with the Forces of Liberty battling in France, and declare war. All Italy was on the Qui Vive. Then suddenly, two days before the event was to take place, the announcement came that, after all, owing to the gravity of the moment, neither the King nor the Cabinet would attend the unveiling. Why this sudden change? All sorts of rumors flew about. The one generally accepted at the time was that the Government had received an intimation that the attendance of the Italian Government on the occasion would be considered by Austria and Germany as a Declaration of war. Another reason reported was that in the excitement none could tell what might be said or what step might be taken to precipitate the crisis. The Italian Government, however, signalized the Day of the Quarto celebration by denouncing formally the Treaty of the Triple Alliance. The King, on the occasion, sent a ringing message to the Sindaco of the town, in which he united the names of Victor Emmanuel, Mazzini, and Garibaldi. This act of the Italian Government was probably the chief reason for the change of programme of the Quarto celebration, though undoubtedly other causes played their part also, one of these being the fact that Italy was not quite ready to make a Declaration of war, however ready she might have been to receive one. Also, whether the Government was ready or not to declare war, an element of those who attended had prepared to do all in their power to force the Government's band. The absence of the King and of the Cabinet from the celebration at Quarto may have given it a somewhat different trend, but certainly not one less violent. The orator of the occasion, Gabriel d'Annunzio, the poet and novelist, who had come from France for the purpose, delivered with telling effect an address which was rather a lyrical rhapsody on Italian Liberty and aspiration than an historical address. It fell on ears attuned to receive it, and was, in fact, a firebrand stuck into a magazine charged and ready for the explosion. That night the streets of Genoa were choked with the crowds that apotheosized Garibaldi and the orator, d'Annunzio, and clamored for war. After this it was a continued progression---nothing could stop it. Not Austria's late conversion, nor all the propaganda of her and Germany's allies---not the Ministry itself could have stayed the flood, even had it wished to do so, which it later transpired was not the case. At Milan, the centre of German commercial and financial interests, demonstrations occurred which quickly turned into very practical demonstrations against Germany. Shops were sacked and bonfires built of their contents before order could be restored. At Turin other demonstrations and disorders---in other towns likewise, if not so extreme. In Rome, where the anti-interventist element was well organized, it was held in check by the interventist elements, who in turn were held in check by the Government representatives of order. But the daily demonstrations kept the Government in such anxiety that half the garrison of Rome was continually on duty, and the Embassies of Austria and Germany were protected by troops to prevent any unfortunate incidents. The orator of Quarto came to Rome in a sort of triumphal procession, and for days spoke in a species of lyric frenzy, from hotel balconies or in theatres to excited crowds who followed him in a state of exaltation. On the 14th he spoke in the Costanza Opera House, which was heavily guarded, all approaches being picketed, by a strong force of police and soldiers, including an extra force of cavalry to preserve order and prevent demonstrations before the Government offices and the Embassies of the Central Empires. The overflow demonstrants, left outside of the Auditorium, resisted all efforts to disperse them, building barricades and tearing down a rear wall around an open lot adjoining the Opera House to use as missiles against the soldiers should the latter be too firm in attempting to clear the streets. The house of Signor Giolitti was also guarded by cavalry. On the 8th of May the tragic news of the sinking of the Lusitania, the day before, with its great loss of life of passengers, sent a thrill of horror throughout Italy, as throughout the rest of the world, and many who had hitherto stood neutral, suddenly took their places with the war partisans. The parliament was gazetted to be reassembled on the 12th of May, but owing to unexpected conditions this was deferred till the 20th. Meantime, the peril of the situation was perfectly recognized in Germany and Austria, and the subjects of both were rapidly leaving Italy---it was said, under orders of their respective Governments. Even in this exigency the Austrian Government hesitated and haggled until the bitter end, conceding only bit by bit, until finally, after War was actually in sight, it made its final concession. It had, indeed, long been too late, for all Italy was now aflame, and no government could have withstood the aroused passion of the Italian people. On the 12th and 13th the streets were the scenes of noisy demonstrations headed toward the Government buildings, which were, however, turned aside by the troops stationed on every street leading thereto. On the evening of the 13th Salandra and his Ministry resigned, and it looked almost as though Germany had won. On the 14th of May the official press announced that, "The constitutional Parties having been unable to give their undivided support to the trend of the Government's Foreign policy at a time when the seriousness of the situation makes such support imperative, the Council of Ministers has decided to hand its resignation to his Majesty." This was the formal official notice of what the people believed to be the work of those who were afraid of Germany, or loved Austria, and would sacrifice Italy to these powers. Although not wholly unexpected it was a bombshell. There was a sudden explosion which shook Italy from the Swiss confine to the far end of Sicily. It was now for the King to speak, and to him Italy appealed, through the People. The days that followed were full of excitement. The "larger towns," like Rome, gave themselves up to demonstrations, clamoring for the end of futile discussion and for the Declaration of War. The Crown Council was summoned in consultation by his Majesty, the King. In the crowds that thronged the streets and piazzas, the cry was constantly heard, "A basso Giolitti! A morte, Giolitti!" And his friends averred that his life was seriously imperilled. (84) The Name "Oberdan" was chalked up on walls---even, on the War-office walls. Every street in Rome that led to a Ministry was picketed by troops in imposing numbers. In the end the People triumphed. The President's "Lusitania-note," warning Germany, made a deep impression and encouraged the Interventionists. On Sunday, the 16th, the most imposing demonstration occurred that Rome had ever seen in modern times. In the afternoon the crowds assembled in the historic Piazza del Popolo, with standards and flags, and almost as if by magic a procession was formed for a huge demonstration and soon, flowing through the streets were a hundred thousand people, headed for the Quirinal, marching to the music of the National hymns. Wherever there were old Garibaldians they were borne on men's shoulders. Up by the British Embassy and down the long "Venti Settembre" they streamed toward the Royal Palace and the Foreign Office. But it was a good-natured crowd, for they knew that day that the King had recalled Salandra and his Cabinet, and that the issue was already decided. The King had spoken. Italy would enter the war. It was reported that both Marcora, the President of the Chamber, and Carcano, later the Minister of Finance, had successively been asked to form a Cabinet, but had declared it impossible except by Salandra. Both were old Garibaldians; so the people were satisfied. On the 20th the Chamber reassembled, and the Government, now reassured as to its strength, made its declaration, and asked for full powers. It was well understood what this portended, and all Rome was afoot. The approaches to the Montecitorio Palace, where the Parliament sat, were guarded by troops in numbers, and the galleries of the Chamber were so packed that it was with difficulty that the Ambassadors could get places. The declaration stated that the Government was conscious of having taken the measures imposed by the noblest aspirations and the most vital interests of the country, and asked for full powers. After the declaration of the Government, which was supported by the war-socialists, the bill granting full War-powers to the Government was proposed, and was carried by a vote of 407 to 74. The following day the Senate adopted the measure granting the Government full War-powers by a unanimous vote. This meant War, and it was celebrated that afternoon by a great demonstration of the people at the Campidoglio, from which historic spot, headed by the Sindic of Rome, and bearing the provincial banners among which figured now those of the Trentino and Trieste, they marched to the Quirinal, where war-speeches were made, and the crowd, assured now of their royal leader's profound sympathy with their aspirations, enthusiastically cheered the King and Queen, who came out on the balcony to unite in the demonstration of Italy's complete accord in this fateful hour. Next afternoon, the 23d, was published the order for the general mobilization of the army the following day, and the provinces along the border were declared in a state of War, a war which, as a socialist deputy who favored it said, was for the "protection of Civilization against Barbarism." And, at last, on the same day, Austria answered the Italian note denouncing the Treaty, and offered to make larger concessions. No wonder the Italian Foreign Minister declared it was "too late." "All my endeavors to continue the discussion," said the Austrian Ambassador, "were met with the ever-recurring phrase, 'It is too late.'" On the 23d the Italian Ambassador at Vienna handed to the Austro-Hungarian Minister for Foreign Affairs Italy's Declaration of war, stating that from the following day, the 24th, his Majesty, the King, would consider himself in a state of War with Austria-Hungary, and the Ambassador asked for his passports. Within an hour or two, the Emperor of Austria issued a proclamation to his people, calling on them to meet their "treacherous ally." It had already been written when Italy declared war. As nothing could be heard from Vienna, the Austrian Ambassador at Rome was given his passports. And the German Ambassador requested his and received them. That night the respective Ambassadors left their posts and the armies of Italy and Austria-Hungary confronted each other along a front of some 500 miles, to settle the long-vexed question as to who should be master of Italy and its people---a question which in one form or another had been under discussion since ancient Rome found her progress barred and her security menaced by the Barbarians who poured down through the passes in the Alps to which Julius Caesar gave the name they bear to-day. Italy boasts and has a right to boast that she was the first Christian nation to elect to surrender voluntarily a position of security and enter the war on the side of Freedom. It was not until August 23, 1916, that war with Germany was declared, and just before this event a Convention was agreed on by which the property and persons of unoffending civilians on both sides were to be respected. On August 21 War was declared by Italy against Turkey, which had been acting for a good while in a manner that testified her hostility to Italy and her people. Italy, indeed, had originally little hostility against Germany, and confessedly owed her in the past a debt of obligation for important aid rendered her, both politically and practically. Her war against Germany was, as the war Socialist Deputy, already quoted, said, to protect Civilization from Barbarism. The instant that War was declared the people of Italy quieted down. All the excitement which had raged during these last few days had subsided. The people of Italy, fully conscious of what it meant, stopped the noisy demonstrations of the piazzas, and set themselves to the silent and serious demonstration of what patriotic devotion could achieve when profoundly in earnest. The Italian people were never so admirable as when in this mood. The day of the actual Declaration of War, the streets of Rome were as quiet as on any spring afternoon. All of the stir and struggle had been transferred to that long front where for 500 miles the armies of Italy began the huge task of forcing back their age-long foe from the most difficult terrene known in warfare, fortified to the last point of military science, and defended by an army which its commanders believed so powerful that they had, a few months before, deliberately delivered gage of battle to half the world. Prince von Bülow, although he did not succeed in holding Italy to neutrality, was successful in his mission to the extent of securing from the Italian Government, before he left Italy, a Convention which was intended to safeguard mutually the economic interests of the two countries, the one in the other, even in the event of War between them. Germany had in recent years established in Italy vast interests, commercial, industrial, and financial. There were in Italy, by a census taken in 1914, some 80,000 German residents, permanent or engaged in affairs likely to lead to permanent residence; the German holdings amounted to seven or eight hundred millions of dollars. The Italians, on the other hand, had many emigrants, mainly laborers, in Germany. Germany and Italy agreed not to trouble the respective civil nationals, or confiscate private property belonging to them. And Germany agreed to keep up the pensions to the Italian laborers within her borders. That the advantage was mutual cannot be denied, though the balance was in Germany's favor. Prince von Bülow apparently had some doubts as to the complete security of this arrangement, for the title to his Villa adjoining the Villa Medici was transferred to an Italian connection. The presence of the German Embassy, vacant as it was, on the site of the most celebrated of the ancient Roman temples: the Temple of Jove on the Capitol, was a continual reminder to the Italian people of the unmeasured egotism and insolent aspirations of Germany. There was a feeling among certain elements in Italy who had been reared in touch with the Triple Alliance that Italy had been placed in an equivocal position by the Government's departure from its declared Neutrality and by its Declaration of War. This idea was sedulously fostered by the influential pro-German and pro-Austrian elements, also by the Peace Socialist party, known as the Official Socialists, which numbered in the Chamber a not numerous, but able minority. A powerful propaganda had been carried on by Germany and Austria, not only in Italy, but in America, to play on Italy's sentiments of honor and loyalty, and hold her up, as bound irrevocably by her Treaty of Alliance with Germany and Austria, yet inclined to blackmail them, and extort from them concessions to which she knew she had no right. The silence of the Government on the subject, whether due to pride or diplomacy, left the implication of their enemies for the most part unchallenged, and the consequences were very unhappy. Even when the Green Book was laid before the Country at the historic Session of the Chamber of May 20, the very eve of the Declaration of War, the Documents which it contained began only with the 9th of December, 1914, and the foes of Italy still insisted that their charge was not refuted. So considerable was this feeling in Italy that eventually the Government deemed it advisable to make an exposition of Italy's precise position in relation to the step taken by her in entering the war. And on the 2d of June, 1915, less than ten days after Italy's Declaration of War against Austria-Hungary, Premier Salandra made a formal address at the Campidoglio, (the Capitol) in which he set forth her precise position. Italy, indeed, was very sensitive on this point, which the Italians considered touched their national honor, and the press of the Allies had not always been prudent. During the previous winter a member of the French Ministry had uttered in the French Chamber a gibe against Italy which offended her so deeply that it threatened serious consequences, and he was obliged to disavow his speech. It was, that Italy was "waiting to fly to the succor of the Victor." Nothing could have wounded her more deeply, for she was at that time nerving herself for the dread decision---not between War on the one side or on the other, but between War on the side of the Allies and Neutrality; and every mother in Italy knew it and knew with blanched cheek what that decision would inevitably be. At that very time the quiet mobilization was going on, and hardly a cabin in Italy was without a man away in camp---"for training "---those who were left knew for what. Signor Salandra set forth in his speech the facts touching Italy's relation to the Triplice and to the war. He quoted from the despatch sent by the Italian Government to the Italian Ambassador at Vienna on July 26, 1914, reporting the warning given to the German Ambassador at Rome (von Flotow) that Italy held that Austria had no right to take such a step as she was taking (against Serbia) without previous accord with her allies. Austria, in fact, declared the Italian Premier, by the terms of her notes and the demands made therein, which indeed were of little value against the Pan-Serb peril, but were most offensive to Serbia and indirectly to Russia, clearly demonstrated her wish to provoke war, and Italy notified her that because of this and because of the defensive and conservative character of the Treaty of the Triple Alliance she felt under no obligation to aid Austria in the event of her getting into a war with Russia, because any European war which might ensue would be the consequence of Austria's own act of provocation and aggression. This was, he stated, followed up by a plain notification to Germany and Austria on the 27th and 28th of July (1914) that unless Italy should obtain the recession of the Italian provinces, held by Austria, and adequate compensation, the Triple Alliance would be irreparably swept away. "Impartial History," declared the Premier, " will say that Austria, having found Italy hostile in July, 1913, and in October of the same year to her plans of aggression against Serbia, attempted last summer in agreement with Germany the method of surprise and of the fait accompli. "The execrable crime of Sarajevo was availed of as a pretext a month after it occurred. This is proved by the refusal of Austria to accept the remissive offers of Serbia. Nor at the moment of the general conflagration would Austria have been contented by the integral acceptance of her ultimatum." In proof of this, he quoted the declaration of Count Berchtold made on the 31st of July, 1914, to the Italian Ambassador that if mediation had been exercised "it would not have been able to interrupt the hostilities already initiated with Serbia." And to this he added the statement of the Austrian Ambassador, Merey, made on the 30th of July to the Italian Minister for Foreign Affairs, Marquis di San Giuliano, sustaining Austria's position, declaring that Austria could give no pledges in regard to not acquiring territory to the damage of Serbia, because she could not foresee whether in the course of the war she would not be obliged against her will to seize Serbian territory, which would, added the Italian Premier, have reduced Serbia to the condition of a vassal State, an act which he showed would, in turn, have eventually brought Italy into a similar condition. In proof of the necessity for Italy's action, he proceeded to show how the Austrian Chief of Staff, General Conrad, had long held the view that war with Italy was necessary, whether because of the question of the Italian Irredente Provinces or of Italy's policy in regard to everything that Austria undertook in the Balkans and in the eastern Mediterranean, and that he had maintained that, in consequence of Italy's opposition to all that Austria wished to undertake in the Balkans, it was necessary to beat her that Austria might have her hands free. He had, indeed , deplored that Austria had not attacked Italy since 1907 . The Premier went on to show how the Austrian Minister for Foreign Affairs had recognized the future of the military party, and held that the Kingdom of Italy should be reduced to impotence in order that the Italian Provinces held by Austria should be deprived of hope in the future, and had advocated the administration of these Provinces with punitive rigor. He further recalled how, after the brilliant operations initiated by the Duke of the Abruzzi against the Turkish torpedo squadron at Previsa, Austria had intervened imperatively to prevent Italy's further operations, whether in the Adriatic or the Ægean Seas. And how, on the 2d of October, 1911, after this act of Austria, the German Ambassador at Vienna had informed the Italian Ambassador that Count Aehrenthal had requested him to telegraph to make the Italian Government understand that if it continued in its naval operations in the Adriatic and Ægean Seas, the Italian Government would have to deal directly with Austria-Hungary. When Aehrenthal failed and was succeeded by Berchtold, the latter declared to the German Ambassador that he held the same views with his predecessor in regard to Italy's operation against the Ottoman coast in Europe and the islands of the Ægean, according to which those operations were deemed contrary to the pledges assumed in the seventh Article of the Treaty of the Triple Alliance. He related how he opposed Italian operations against the Dardanelles, and declared that if the Italian Government desired to retake its liberty of action, the Imperial and Royal Government would do likewise, adding that he would not admit Italy's right to take any action of the kind in opposition to his point of view. This attitude of Austria, declared the Italian Premier, reinforced Turkey, which felt itself protected by the Allies of Italy against every attack in any vital part of her empire. Having shown Austria's attitude of hostility to Italy in the critical moments of her war with Turkey---a war which, he asserted, was caused in part by the necessity to forestall the rapacious progress of the Central Empires---the Italian Premier took up and discussed the charges made by the Emperors of Austria and Germany that Italy looked with lascivious eyes on the patrimony of the former's House, and the charge of the Chancellor, von Bethmann-Hollweg, that he was endeavoring to obtain concessions from Austria to purchase Italy's fidelity. The Italian Premier declared that the objects of Italy in discussing these concessions were three: First, the defense of the Italian race, which he declared Italy's first duty; second, to obtain and secure a defensible frontier in substitution of that imposed on Italy in 1866, which left the gates and the shores of Italy wide open to her adversaries; third, a strategic position in the Adriatic less unsafe, less unhappy than Italy possessed, the effects of which were made clear by this war. He described the gradual increase of the offers of concessions, and declared that Italy had been more than temperate on her part, and he defended with warmth the policy of his Government in rejecting the offers which Germany, and eventually Austria, had tendered to Italy to maintain her neutrality. These, if accepted, would, he asserted, have constituted a renewed Triple Alliance, formed of one Sovereign State, Germany, and two States substantially vassals, Italy and Austria, and he declared in the name of his Country that the dream "of universal hegemony has been broken. War has arisen. The peace and civilization of Humanity in the future must be founded on respect for complete National Autonomies, among which Germany will be obliged to live the equal of the others, but not their mistress." This speech made a profound impression in Italy. It relieved those who had felt that Italy had placed herself in an equivocal position before the world and it inspired the hope that the world would now understand the sound basis of her action. To gain any idea of what Italy's military accomplishment was during the war, one must not only study the war-map of the war-front, where Italy guarded nearly 500 miles of mountain front, but must project the imagination to this mountainous region where, with the strategic positions all against her, and a frontier laid down with the express intent of rendering Austria impregnable while it rendered Italy vulnerable, she was forced to fight up-hill and maintain what she might win under conditions whose difficulties were unparalleled in any other part of the Allied front. The map will show a zigzag line following with faithful subordination a frontier commanded by the chain of strategic positions laid down by Austria, from the Swiss border to the Adriatic, when the latter turned over: first, Lombardy and later, Venetia to France to hand on to Italy. In length, it is said in Italian works, to be actually longer than the line from the shores of the North Sea to the Swiss border, where France was straining every energy though supported with all the power of Belgium, England, some aid from Portugal and Russia, and later all the power of America. Beginning at the Swiss border, where she controlled the Stelvio Pass, Austria's line ran almost due south, taking in the commanding summits to and including the Adamello, and on across the head of Lake Idro (Eridio), and so on south to the top of the great divide between it and Lake Garda, where it doubled back and presently turning eastward crossed the lake, and at a commanding point turned southward again along Mount Baldo, thus securing on both sides of Lake Garda the command of this long lake for no inconsiderable part of its length. From this point the frontier stretched eastward, crossing the Adige, and then turned northeastward, ever following the commanding strategic line, taking in the Trentino and the Sugana Valley. Then utilizing the lofty barrier of the Carnic Alps, it passed southeastwardly to swerve south at Montasio and, crossing the Friuli plain, reached the Adriatic some distance west of the Isonzo. Within this meandering line of mountain fortresses Austria had locked the Trentino and Gorizian provinces, and had formed, as she supposed, an impregnable barrier. But more than this, she had created a formidable menace to Italy as a guaranty of the latter's good behavior. A glance at the map will show that Austria, holding the Trentino, extended like a wedge down toward the base of the plains of Lombardy and Venetia, and thence stretched along their flank in a way to enable her to descend on these fertile regions and cut them off from Italy, whenever she was willing to make the sacrifices needed for the enterprise. She held all the passes into Italy and all the mountains guarding them. She possessed the superiority, not only in position, but in numbers and matériel of war, and, according to past history, she was superior on the field. Against these elements of superiority Italy had only herself, her immemorial wrongs, and the spirit of her people, informed by patriotic fervor and love of Liberty. Hopelessly inferior when the war broke out as to equipment and training, Italy had made good progress during the ten months that had elapsed since that eventful day; but she was still inferior in equipment and matériel. Moreover, Austria had not neglected during that time to prepare for eventualities. The natural defenses of her frontier were strengthened to the last degree of modern military science, and every approach to that long and beetling line had been fortified till they were the final expression of scientific skill. There had been a time when Italy's entry into the war against her might have been apprehended by Austria---when Russia was pushing forward victoriously through the Carpathians, and Roumania and Greece were apparently on the verge of espousing the side of the Allies. This danger had now passed. The scale was swinging the other way---Russia was being pushed back through the Carpathians. She had lost a considerable part of what she had gained, and her armies were showing evidences of suffering from the demoralization of the internal administration of Russia, which had eaten into the military administration. Libau had fallen on May 9, and the forceps were being pushed farther forward, both to the northward and to the southward, to close in and crush completely all within their grasp. Roumania, who at one time was expected to come in with Italy, had thought better of it, and Greece was falling under the sway of those friendly to the Empires. It was just at this time that Von Mackensen, having got his full strength up, was concentrating all his efforts against Przemysl, and was forcing the Russians back from the San. Demitrieff had retreated beyond the Wistock before the German-Austrian forces early in May. Ivanof was conscious of the peril to his armies to the south of the Vistula, and as Demitrieff retreated, Brusiloff's position in the Carpathians became too precarious and he also fell back. By the end of May Przemysl was almost recaptured from the Russians, and the beginning of the end of the great Russian offensive was in sight. The city fell June 3, but its capture had been a foregone conclusion for some time. Lemberg fell a few weeks later, and the great forceps were closing in on Warsaw. It was charged by Italy's foes, and credited by many not her foes, that Italy entered the war believing that it was already won by the Allies. The charge is without a shadow of foundation. Indeed, it was so far from true, that no one who knew the facts could have failed to realize the gravity of the situation in France, where, during April and the early part of May, the new German weapon, the asphyxiating gas, had given them the advantage in the fighting along the Ypres Canal, in the long second battle of Ypres, and on down in Artois, north of Arras, Kitchener's new army was being rushed across the channel with all despatch to receive the hard-pressed and worn troops on the Flanders line. Nearly all Italians doubtless believed that Italy's entry in the war should prove decisive, and within a reasonable time; and a great many believed that it would bring the war to an end within a few months---perhaps, by the end of the following autumn. But none but fools imagined that therefore the final victory would be won save by hard fighting and vast sacrifices. History may show that the Italians have glaring faults, but it does not show that they shrink from sacrifices, however vast. Italy knew well how badly Russian affairs were going. She also knew that the enterprise of the Dardanelles, so boldly undertaken and so valorously pressed, was not justifying the hopes entertained of the issue. In fact, Italy was more familiar with the character and the situation of the Peoples to the east of her than her more westerly Allies. She was under no illusions. In the very beginning of her participation in the war Italy had to consider certain things which presented to her a somewhat delicate situation, diverse from that of her allies politically. Her left flank rested on a small neutral country with a population racially divided, of which the considerable majority were of German origin. This country was insulated, and was dependent on the Central Empires for much of the prime materials on which the people subsisted, in exchange for which she furnished them her products. She was thus in a somewhat peculiar position as regarded the belligerents. She might, whether with or without her consent, prove a covered way for them to pass and descend on Italy, and in any event, whether she remained neutral or not, she could not but be a middle zone in which the emissaries of Italy's enemies might lurk with security and become conduits of intelligence to the enemy regarding Italy, and that in fact is what happened. Thus, there was always an eye to be kept on that quarter, and a close watch was necessary to see that material sent into Switzerland should not find its way to the enemy. From the military standpoint, also, the situation was individual to Italy. The political difficulties caused a situation which affected somewhat the military. From the point of junction at the Swiss border, commanded by the Stelvio, along the entire front through the mountains, the line had been laid out by Austria with especial reference to leaving her holding the commanding positions. Thus, it may be said that Italy was exceptionally exposed to attack through the passes that led down through the Trentino, and those which to the northeastward led down into the Friuli plains, where the first lines of any strength were those of the Tagliamento, while, on the other hand, Austria was secured by the possession of the imposing mountains guarding the Trentino route and by those guarding the Isonzo line, completely dominated by Monte Nero; by the fortress of Tolmino; by the lofty table-lands of Bainsizza, and by the supposedly impregnable Carso. This line may be likened to---what it was, indeed---a vast rampart, a mile high, with frowning towers yet higher, jutting forth overlooking Italy, and guarding a score of gates through which those who held it could pour down on the Italian plains, overwhelming them like the avalanches from the mountains behind them. This was what the Austrians boasted as their aim and determined purpose, and what they on two occasions attempted, and would have accomplished but for the resolution with which they were first stayed and then swept back. Down these defiles, through these gateways, Goth and Hun had poured of old to ravage the Italian plains and sack the Italian cities, and through them the Roman Legions had surged, driving their way upward to conquer the invaders in their own lands, as later another and even greater soldier of Italian blood had passed to impose for a time his will on the world. And now Austria, who had fallen before him and then had triumphed over him, once more held the ramparts and the gates, ready to swarm through them and wreck her vengeance on those who barred her way. In fact, it was through the passes mentioned that the two drives were made by Austria in the summer of 1916 and the autumn of 1917, which placed Italy for a time in such deadly peril, and might, and indeed probably would, have decided the issue of the war but for the way in which Italy summoned all her forces of resolution and valor in the supreme efforts which first held, and then repelled the invasion. Italy was distinctly inferior to Austria, not only in position, but in matériel of war, especially in artillery. It was necessary for her to deprive her potent enemy, if possible, of the advantage of initiative, and this she could do only by attacking and forcing the fighting. Otherwise, Austria with some twenty-five divisions might, by attacking at once along the Trentino and Isonzo lines, overwhelm one of the sections of the far-stretched Italian front. The Trentino section probably offered the best field for an attack with a promise of immediate gains, for it was understood that the Austrian forces were not as numerous there as on the Isonzo front, which more immediately guarded what might be considered the direct passageway into Austria and the road to Vienna. And the Trentino was an inspiring name for Italy. But such an attack would not have the moral effect on Austria that a successful advance on the Isonzo would be likely to have. Accordingly, it was decided to make the chief assault on the latter front, while the assault on the Trentino front was intended rather as a containing movement. In any case it was necessary to perfect the plan with the utmost nicety in every detail ---and this was done. The genius of the Italians lies in this direction, as was evidenced on numerous occasions during the war. And General Cadorna was a master in this matter. An attack was made on the Austrian positions guarding the Trentino wedge from every side: on the Val Giudicaria, up the valley of the Adige, the Val Sugana, up and across the heights of Fiera di Primiero, through Cortino di Ampezzo, on toward the massives of the Tofano, and Cristallo. And on along the massives of the Carnic Alps the assaults were pressed in regions where only ardor fused into stern valor could avail for even the least success. And then the chief assault was delivered from the mountains above the Isonzo to the southern border of the plains that stretched away to the Adriatic. The attack was not merely most difficult, it would have appeared at first impossible, and only the fury with which the assaults were delivered and pressed can account for the successes that were gained. But it was not an ordinary battle or series of engagements. Italy felt that she was fighting for her own. Not a stream, valley, or mountain in all that region that had not once belonged to Italy, and been fought for by her sons generation after generation; not a town or village nestled in a little valley, or perched on a mountain shoulder, but had furnished some hero or man of mark to enrich her annals. The genius of her people spoke in every façade and rang from every campanile. Her poets had sung of them; her painters had pictured them; her martyrs had died for them; and although under Austrian oppression and expropriation, the Italians there had sensibly diminished in numbers, schools had been closed, and the use of the Italian tongue had been proscribed, it was to the Italians still Italy, the very stones without which the arch of Italian Unity would never be complete, nor would ever stand. So, Italy felt that she was fighting for her own, and this inspired her accomplishment of what on its face appeared almost impossible: the seizure of many important fortresses in the Austrian first line of defense, and the definite pushing back of the Austrian line beyond mountain after mountain and valley after valley, until it was to the westward sensibly forced back and to the eastward was beyond the Isonzo. But it was not without huge losses that this advance was achieved, and the toll taken in those regions for every foot gained was heavy indeed. In the Trentino the terrene was such that save in narrow, tortuous valleys, even in times of peace, none but trained mountain-climbers could make their way. In this region now the Alpine Corps was used, and was indeed necessary; for the work in important parts had to be done amid the eternal snows, and against them were pitted the Austrian Alpine Corps. War had not yet been declared against Germany, and for sundry reasons; the most cogent of which was that Italy had quite enough on her hands as it was, and could not reach Germany save across Austria and France. She preferred that Germany should declare war on her, and in such case her people would have been instantly consolidated against her, as they already were against Austria. Nevertheless, the Italians drove forward, if slowly, steadily, and by the close of Autumn they had captured the principal Austrian positions in their first line from the Stelvio to the Adriatic, and a portion of those in the Austrian second line. And when the winter closed in, the Austrian advanced lines were in certain sectors thirty or more kilometres farther from their original front than when the war began, and the Lombard and Venetian plains and cities were to this extent rendered more secure. Italy began to breathe more freely, and so did France and England; for the apprehension that Austria might send potent reinforcements to the German-French front had sensibly diminished, even though Russia had been driven back and the Dardanelles enterprise, on which so many hopes had been founded, had come to naught. This advance of Italy, however, had not been accomplished without heavy losses, far heavier than was known generally; for Italy did not publish her losses. Austria had ever the position of advantage; and every point, every height, was guarded, and had to be captured and held under a commanding fire from some eminence yet higher. Often tunnels had to be cut in the living rock, and among the noted engineering feats of the war was the tunnelling and the blowing away of the entire top of the mountain on which was established a fortress believed to be impregnable which commanded all the approaches for miles on either side. It was the exceptional difficulties of the terrene which, added to the customary difficulties of all the fronts in this war of Titanic forces and weapons, rendered the work of the Italians so extraordinary that they have been said to have performed the miraculous and to have accomplished the impossible. To begin with, the main Italian front was on the extreme northern frontier of Italy, and not only her troops had to be transported long distances, but all provisions and materiel of war. All of her coal and iron and much of her food-supplies had to be imported. There were railroads with more tunnels than kilometres, and almost as many bridges. These all had to be guarded, and when the actual front was reached, the difficulties of transportation were such that it took five men to perform what three could do on the French front. No inconsiderable part of her fighting was done amid perpetual snows; and often her lines had to be established on mountain-tops where guns, ammunition, equipment of all kinds, timber for huts, provisions, everything, had to be carried up on cable railways swung from peaks thousands of feet high. On the 22d of May the order for general Mobilization was issued. But the Italian army had long been substantially mobilized. On the 25th the King left Rome for the front, as the Commander-in-Chief of the Italian armies. He had appointed his maternal uncle, Thomas, Duke of Genoa, to act as Regent in his place during his absence, and to those assembled at the railway-station to bid him adieu, the King said, as the train pulled out: "Arrivederei alla guerra finita." From this time till the war was ended, he was always at the front, living simply, with his Headquarters in some modest country-house which, wherever it was, was known as the Villa d'Italia; spending his days at the front among the men, inspecting the lines; receiving in the evenings Government Officials or national guests, who were lodged much more luxuriously than the Royal host. He apparently did not interfere in any manner with the Command, which was intrusted to the General Staff, known as, the Commando Supremo, with General Luigi Cadorna at its head until after the event of Caporetto, when General Diaz was placed at the head of the Commando Supremo. But undoubtedly his cool judgment, complete training, sagacious counsel, and serene courage, which is the family endowment of the House of Savoy, were ever at the service of the General Staff, and must often have been an inspiring element in the decisions which led to eventual victory. The continued and almost uninterrupted presence of the King at the front---for he returned to Rome only a few times during the war when his presence there appeared to be required by some great political exigency---was at times made the subject of comment by those who probably would in any case have been inclined to be critical. But there can be no question that his presence among his soldiers, where he was often to be found in such exposed places as to bring protests from those in charge of the lines, was a moral factor in Italy's stubborn resistance and an effective contribution to the final success that cannot be measured. Stories about the Spartan simplicity of his life; the fearlessness with which he exposed himself when not prevented by those responsible for the safety of his person; his unaffected and fatherly interest in the comfort of the soldiers; his tireless devotion to duty; his knowledge and understanding of conditions, were current among all ranks, and were treasured in the hearts of the men in a way which no attempt at regal splendor could have accomplished. He was a King according to the modern Evange, the true Chief and Captain of his people, and Italy knew it. On occasion he issued a ringing message to his people which rang like a trumpet; but for the most part he effaced himself personally and left the applause to others, content to feel that Italy was reaping the fruit of his devotion. While the King was at the front, self-effaced so far as public participation in the command of operations was concerned, yet felt by all Italy, military and civic, to be on the spot where his presence counted most, the Queen was with equal quietness, yet with equal effectiveness, heading the work which War always, and this War especially, imposed on women. And nowhere more than in Italy did the women perform with devotion and efficiency this work. The dearth of materials, the narrowness of means in Italy were exceptional, and had to be made up by exceptional personal devotion to the cause. In this the Queen of Italy took the lead. As soon as Italy entered the war she placed the great Quirinal Palace in the hands of competent experts, and transformed it into a hospital, complete in equipment, and up to date in every respect. The work was done under her personal supervision, and when in the summer the hospitals at the north began to be crowded, and the wounded were sent farther south, the former palace of the Popes and the present palace of the King of Italy was filled with Italian wounded---private soldiers---under the personal superintendence of Her Majesty the Queen herself. There were other hospitals added under her superintendence later on; but the Quirinal Palace was the first hospital conducted by her, and was so conducted until the end of the war. In this connection it may be as well to state here as elsewhere the work of the Royal House of Savoy during the war. As the Queen conducted her hospital in her palace, so the Queen Mother established and conducted a similar one in the Villa Margherita. And under the King as Commander-in-Chief of the Italian Army and Navy, the Duke d'Aosta commanded the Third Italian Army, whose accomplishment on the section of the Isonzo next to the Adriatic, from the inception of operations to the final defeat of the Austrian armies, is one of the achievements of the war. And the Duke of the Abruzzi commanded the Italian Fleet during all the earlier period of the war, when the command of the Adriatic was secured, while the younger members of the House of Savoy performed their part with devotion, shunning no danger and shirking no toil, in their several positions as soldiers and seamen representative of Italy, rather than of the Royal House. The Duchess d'Aosta became the head of the Italian Red Cross, and not merely in an administrative capacity, but in active work, not only at the rear, but in the war zone wherever duty called, she gave herself in full measure to the great cause. General Cadorna, who was at the head of the Commando Supremo, was, like nearly all the commanding Generals on both sides, no longer young. He was the son of that General Cadorna who had commanded the troops at the capture of Rome in 1870. He had a great reputation in Italy, not only as a Commander of troops in the field, but as a writer of high authority on Military Science. And the skill with which the Italian army in every department was organized justified fully his reputation, as well as that of the Minister for War, General Vittorio Italo Zupelli. To these two was largely due the unobtrusive, complete, and successful organization of the Italian Army, which on Italy's entry in the war was stretched along the extended Italian Austrian border, and immediately advancing to the attack, forced the fighting along 800 kilometres of front, which kept the war substantially beyond the Italian confines till the invasion after Caporetto and never slacked till the snows in the mountains prevented further offensive operations on either side. When this interposition came, Italy had pushed back the Austrian lines along nearly the entire front an appreciable distance, in some sectors as much as thirty kilometres. She had forced the nearer passes of the Dolomites and the Carnic Alps, and captured the commanding mountains above the valleys of Cortino di Ampezzo, the Val Sugana, and the Val Lagerina. Cortino di Ampezzo was occupied on May 30. Throughout the summer the fiercest fighting continued about Monte Croce and the Val di Inferno, the Italians forcing back the Austrians step by step, till they had secured positions which overlooked the Pusterthal, with its important railway line. On the Isonzo front the Italians had forced the Austrians back in the beginning from the frontier to the line of the Isonzo, where the latter occupied a position of great strength from Monte Nero to the Adriatic, and by the 1st of June the Italian armies were attacking the river line, their left against Monte Nero, the chief forward bastion of the Julian Alps; the centre against Gorizia, and the right against Monfalcone on the coast, and the roads to Trieste, guarded by the great rock table-land of the Carso. Monfalcone, with its shipyard, fell on June 9, but the heights of the Carso towered before them, apparently as impregnable as Gibraltar. Gradisca was captured and a crossing was forced at Plava to the north of Gorizia, notwithstanding floods and the determined resistance of the Austrians. Great efforts were made to capture both Gorizia and the Carso, but the former was too well protected by the heights of Monte Sabotino, on the north, Podgora in front, and the Monte San Michele on the south, while the Carso was one of the strongest defensive positions on the entire war-front. The general movement forward was begun in mid-June. The crossing of the river was effected, Sagrado was captured, and by the end of June the Italians had established a bridge-head beyond the river and were pressing up the side of the Carso under the flaming fire of the Austrian defenses, made to protect every point. It was carried once, but when the Italians had reached the top it could not be held against the tremendous fire directed against it. All that the Italians could do was to hold what they had so hardly won and consolidate their new positions along or above the Isonzo, and prepare for the opening of the Spring. Italy had gained some 2,000 square kilometres of its Irredentist regions, emancipating some 100,000 Irredentist Italians, and was intrenched on the slopes of Podgora and Monte Sabotino, the key to Gorizia. The fighting had been furious and the losses heavy, but the spirit of the Italian troops had been greatly raised by their success, and the morale was excellent, both at the front and throughout Italy. Notwithstanding the obstinate defense of the Austrians, it had been shown that Italian Generals were their superiors, and Italian troops could drive them from their strongest positions, fortified and defended by every device known to military science. At sea the Italians had been equally active and equally efficient, though the field of their activity was mainly the Adriatic, which was far removed from those zones which were of chief interest to the other Allies. But however the latter might concern more nearly England and France, the Adriatic was of vital concern to Italy, and indirectly to her Allies as well. Serbia's stand against Austria-Hungary spurred on by Germany, having been the immediate occasion of the war, she was called on at the very beginning of the struggle to withstand the shock of the almost full weight of Austria thrown against her. For Russia had not yet got into the struggle in the South sufficiently to distract greatly the Austrian forces. For a time Serbia recoiled, but, gathering her forces in a supreme effort, she attacked the invading army with such resolution that they were driven back beyond her borders. The Austrians then were forced to give much attention to the Russian armies that were driving forward on that eastern flank of the Empire. When they began to obtain success in this direction and Russia was falling back, Italy came into the strife. Thus, Serbia was still able to cope successfully with the forces thrown against her. 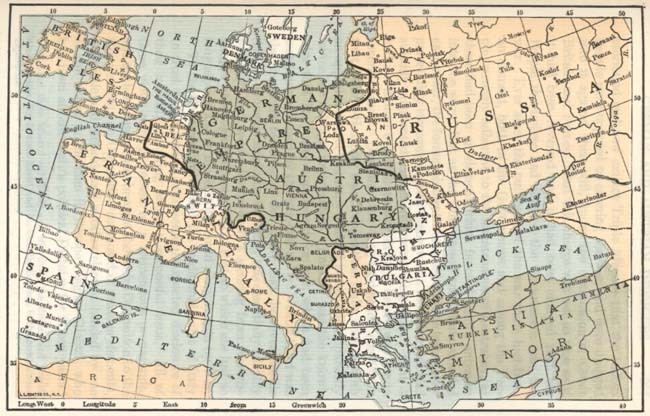 Throughout the following spring and summer (1915) the Allies were engaged in a blundering way in an effort to secure the adhesion of the other Balkan States to their cause, especially of Bulgaria, who, as the sequel proved, was as strongly pro-Austrian as Serbia was pro-French. The Gallipoli enterprise was an episode---a costly one---in this proceeding. It was considered that if Constantinople and the Dardanelles were captured, the somewhat difficult diplomatic contest in the Balkans would be won---Roumania and Greece would join the Allied cause, and Bulgaria, whose strategic position was of great importance, would be forced to take the same side. Greece, where at the time Venizelos was in power, was eager to have the Allies send a sufficient force to the Ægean coast to join her in a movement against Constantinople, which she felt could be captured only by this plan. She, however, wanted what the Allies were unwilling to grant her, and they thought that they could capture Constantinople without her, and force Greece to come in without making the concessions she demanded. These concessions would have disposed of all chance of their winning over Bulgaria, whom they thought of more value than Greece. The defeat of the Russians and the failure of the attack on Constantinople lost Roumania for the time being to the allied cause, and Greece fell more and more under the influence of the Empires, until she also was, for the time being, wholly lost to the Allies; Venizelos was driven out, and it was a close thing that she did not side openly with the Central Empires. Bulgaria appeared now to be the key to the situation, and she long played her cards with such skill that she was wooed zealously by both sides. Finally Germany and Austria won, as a clear apprehension of the situation might have satisfied all concerned they would inevitably do in such a contest. They dangled before Bulgaria Constantinople, even if they did not promise it to her, while, on the other hand, it had been conceded to Russia by the Allies. And they, at least, promised to give her all she wished of Macedonia, Serbia and Roumania. Bulgaria's demands were known, but the Allies were unwilling to concede them until too late, even if they ever were willing. Important territory which she demanded was held by Roumania; and Greece and Serbia likewise were in possession of a part of what she claimed and had once possessed. An attempt was made to obtain Roumania's consent to turn over to Bulgaria what she held that Bulgaria claimed. The same course was pursued with Serbia, but not unnaturally this was refused in both cases. The only possible way to have secured for Bulgaria this sine qua non would have been to insist firmly, and then compensate Roumania from other territory equally valuable to her. This, however, was not done, and in September it became known that Bulgaria was mobilizing. Serbia, recognizing the increasing menace to her, desired to attack her hostile Balkan sister before she could mobilize, but the Allies fatuously believed that they still had a chance of appeasing Bulgaria, and prohibited the only possible method of insuring Serbia's security. So, Bulgaria mobilized unhindered. Von Mackensen had come down to take command on the north of Serbia, and the attack was made on her simultaneously from the north and the east, and was pushed home. Belgrade was evacuated on October 9. The Austrians crossed the Save and the Drina, and forced the Serbians back while the Bulgarians advanced against Nish and Uskub, driving the Serbian army from their positions. Uskub fell toward the end of October. On the 30th the Austrians captured Kragujevac. Nish held out till substantially invested, but fell in November, and the shattered Serbian army, which had done such heroic fighting, retreated southward and westward, leaving more than half of Serbia in the hands of the Austrians and Bulgarians, who soon overran nearly the whole of Serbia, and all of Montenegro and Albania, save Valona, which the Italians held. Some twenty odd thousand Serbians got away to the south, where they were able to maintain themselves till relieved by the Allies who, under General Sarrail, had occupied Salonika, in October. The major portion, approximating 100,000 men, having lost or destroyed nearly all of their guns and trains, made their way---taking with them some twenty odd thousand Austrian prisoners---through the snow-clad mountains of Montenegro and Albania to the Adriatic coast, whence eventually they were transported to Corfu and other points for reorganization. It was one of the most inexplicable of the disasters suffered by the Allies during the war---this sacrifice of Serbia and her brave army. While the Italian Armies were engaged in the Titanic struggle against the Austrian Armies, and the Navy was guarding the Terrene and Adriatic shores, doing necessary transport-service and fighting whenever chance offered, political events were taking place in Italy which bore strongly on the progress of the war and on its final result. The enforced retreat of the Russians continued steadily through June, and, after Przemysl, Leopoli was abandoned, and the retreat continued under conditions which enabled Austria to reinforce her armies against both Italy and Serbia. The apparent disorganization of the Russian armies; the failure of the Gallipoli expedition to accomplish its object, and the manifest pressure on the Serbian army had their repercussion in Turkey, and the Porte assumed promptly a more hostile and certainly a harsher attitude toward Italy and Italian citizens within the Turkish dominions, and began to encourage the already serious revolt against Italy in the provinces of Tripoli and Cirenaica, which had been left to her by the Treaty of Lausanne after the recent Italo-Turkish war. Since the outbreak of the war the summer before, followed by the bracing-up of Turkey through the arrival of the Goeben and Breslau at Constantinople, Turkey had shown much insolence toward Italy. In November Turkish officials had invaded the Italian Consulate of Hodeida and seized the British Consul. He had, after a long diplomatic wrangle, been released, and on Italy's firmness the matter had been adjusted in February (8). The Consul had been released, excuses had been made, and due honors had been rendered to the Italian flag; but the feeling had always remained. The diplomatic situation soon became more tense, and the capture of a Turkish vessel, laden both with arms and munitions of war, and with the even more potent "sinews of war," despatched by Turkey to the already hostile Senussi in Cirenaica, led to an immediate explosion on the part of the Italian Press, and a general demand that the equivocal situation should cease. Contemporaneously, Italian citizens endeavoring to leave Asia Minor were obstructed by the Turkish authorities, and after an ultimatum had been sent by the Italian Government without any satisfactory response, Italy, on the 20th of August (1915), declared war against Turkey, and some two months later (October 10) against Bulgaria. The Isonzo line, where, as has been stated, the Italians elected to make their supreme effort, was well adapted for defense from the Austrian side. The Austrians believed it impregnable, with its hills and mountains, and deep, winding river rushing swiftly between them to debouch at last into the plain, and finish its course as though trying to escape the frowning guard of the Carso. Of this line the two pillars are Monte Nero and the Carso, the former rearing its huge bulk as a vast buttress of the Julian Alps above the passes that lead down to Cividale, and thence to Udine and the Venetian Plain; and above Tolmino where the Isonzo has through the ages cut its way through, swerving by Plava around Monte Kuk; on between Monte San Grado on the East, and Monte Sabotino on the West; on, under Podgora, by Gorizia and thence on through the open plain. The Carso is a huge, high, rocky table-land between Gorizia and the Adriatic, bordering the Gulf of Trieste from Monfalcone almost to Trieste. Between these two mighty pillars lie other mountains that guard the Isonzo River line. Most of these are on the Austrian or Eastern bank, but Monte Sabotino is on the Western side and, while higher up, where the river has cut a great gorge through by Plava, the Austrians were at the very first driven, or retired behind the Isonzo, they held on grimly to Monte Sabotino and the Podgora, as the keys to Gorizia and the passway to Trieste. In the beginning, in June, 1915, the Italians had forced the crossing of the Isonzo at Plava, and established a bridgehead on the hill of Plava, above the Eastern bank. This they extended till they had got Zagora on the lower slope of Monte Kuk, north of Gorizia. With the same dash they had early seized and established themselves on Monte Nero, though only after desperate fighting, and with losses which were too heavy to be published. General Cadorna's bulletins gave only the barest facts. His very reticence, however, and absence of all declamation inspired a new confidence in him. But the Italians, though weaker in artillery, had won against the Austrians, and had wrested from them one of their most impregnable defenses in the Julian Alps. It was a measure of spiritual forces between the two Peoples, and Italians had won. So, though the cost had been great, Italy rejoiced. She felt that she had the Generals, she had the men. They had given her the fruits of their genius and valor. Those were great days, those early weeks of what Italy came to speak of as "Our war." Hardly a week passed that did not register the capture of some mountain or valley, town or village, whose name meant to Italy enough to mark her security and her glory. With Russia being driven steadily back and Serbia held up and in danger of breaking, it was necessary for Italy to push forward. In the Trentino she had driven as far Northward as she could till the snows should begin to give way and she had, as she felt, established her position there. But the region at the head of the Adriatic was still open, and on fine days Gorizia---beyond the Isonzo---still shone in the autumn sunlight, guarded by Sabotino and the Podgora. To the Southward, beyond Gorizia, the passes led on to Trieste, guarded by the Carso; moreover, a foe as grim as the Austrians was on the way. The Cholera had come with the Austrian reinforcements from the Eastward, and no time was to be lost. Should the Austrians break through, they might be stopped; should the Cholera break through, all Italy might be swept. It did not break through, and the skill with which it was barred was one of Italy's claims to gratitude on the part of her Allies. Both the Sabotino and the Carso had to be taken to make good Italy's aspiration, if not to save the Cause. All summer the Italians, their right wing under the Duke d'Aosta, had been fighting forward foot by foot. The Carso was carried once to the very top, but flesh and blood could not stand the fierce fire, shell-fire, that swept the rocky plateau, with no shelter nor means of improvising shelter. It was at the end of October when the Italians began the great attack on Monte Sabotino. With only the organization and equipment of that early period of the war the position was impregnable. What valor and devotion could accomplish was accomplished; but neither Sabotino nor the Carso was carried till the summer of 1916, and the latter not completely till much later. The ground, however, was laid during that autumn and winter of 1915, and heroism was never displayed more unmeasuredly in Italy or elsewhere than in those bitter months, when the Italians, keyed to the limit of endurance, dashed in wave after wave of desperate valor only to break in crimsoned foam upon impregnable cliffs. Yet, as the sheerest headland may in time be tunnelled by the recurrent waves, who shall deny that the persistent storming by the Italian soldiery in that autumn and winter prepared the way for the final capture of the Sabotino, the Podgora, the Bainsizza Ridge, Monte Santo, San Gabriele; of the Carso, and finally of the whole of now redeemed Italy! It was the spirit which underlay, inspired, and informed that long and desperate adventure that led Italy to gird herself anew for her protracted and arduous task of reorganization, reconstruction, re-establishment, and reapplication of all her forces, economic and military, to the vast labor, sacrifice, and endurance that now opened before her. The year 1915 closed without the war having been brought apparently nearer to an end. Although there had been a certain shifting of relations, it could not be said that any distinct advantage had been gained on either side which gave promise of an early settlement. In France, while there had been a certain change in the situation which made it probable that the German armies would not be likely to make a great advance again, the latter had dug themselves in from the North Sea to the Swiss border, and held within their lines nearly the whole of Belgium and substantially a dozen departments of France. The Germans, however, were to a great extent shut in by the Allies' blockade from the seas beyond the North Sea, and even in the North Sea her action was limited. Wherever elements of the British and German fleets had met, the results had been in favor of England save in one engagement in the Pacific, where the Germans had outmanoeuvred the British. On the other hand, to meet this she was speeding up her submarine campaign and was intensifying, in every way in her power, her "policy of Frightfulness." She was sinking passenger-ships. She had built and was now using her Zeppelins in raids which dropped bombs indiscriminately on towns fortified and unfortified, and was pushing her campaign of moral effect in every direction conceivable. Her organization for propaganda throughout all countries had reached extraordinary proportions, causing great anxiety among the Allies and those in sympathy with them. German organization was beginning to impress the world and her propaganda was telling in many directions. Against this the Allies' action at sea touching neutrals was creating much irritation and causing lack of sympathy. The attempt to capture Constantinople had failed miserably, and Gallipoli had finally been evacuated in December. The expedition into Mesopotamia had a like fate of failure. In both enterprises the greatest courage and resolution had been shown without the necessary organization. On the other hand, Salonika had been occupied, though whether it could be permanently held was still a question, and the movements against the German Colonies had met with general success. The African Colonies had been largely occupied, and the German forces there were everywhere on the defensive. On the Russian front the Central Empires had been largely successful. The Russian armies had been driven back substantially all along the line, and had lost all that had been gained in the beginning of the war. The Tzar had taken personal charge of the command of his armies. These occupied a line some 200 miles east of Warsaw. It was known that something was wrong, but what it was no one quite knew. On the other hand, England was now aroused to the gravity of the situation and all of her forces were beginning to be marshalled. The great British Dominions were now aroused. In the sequel 3,000,000 men joined the colors by voluntary enlistment! On the long right wing of the line of the Allies where Bulgaria had come in, not only had Russia been driven back, but Serbia had been destroyed; a month later, Montenegro had been overrun and crushed, and Turkey had been reorganized and strengthened. Italy alone had a clear success to show for her work.